Many times when I was little, I would try baking cookies on my own and forget and/or mix up ingredients. Take for example the time I filmed my friend and I making chocolate chip cookies, as if we were on a cooking show. We left out the vanilla extract. There’s the time I put in baking soda rather than powder in a recipe. And then there’s the big “no-no” of melting butter in cookie recipes. Using stiff butter is the proper way to make cookie dough, regardless of how difficult it is to cream. One of those $200 pink KitchenAid stand mixers is what I lust after. Unfortunately, as a college student, I don’t have a stand mixer or even a hand mixer, nor are my arms and willpower strong enough to cream butter and sugar by hand. This is when cookie bars come into the picture. Like brownies, bar cookies typically involve (cooled) melted butter, whether in the microwave or on the stovetop, in order to add consistency to the batter. 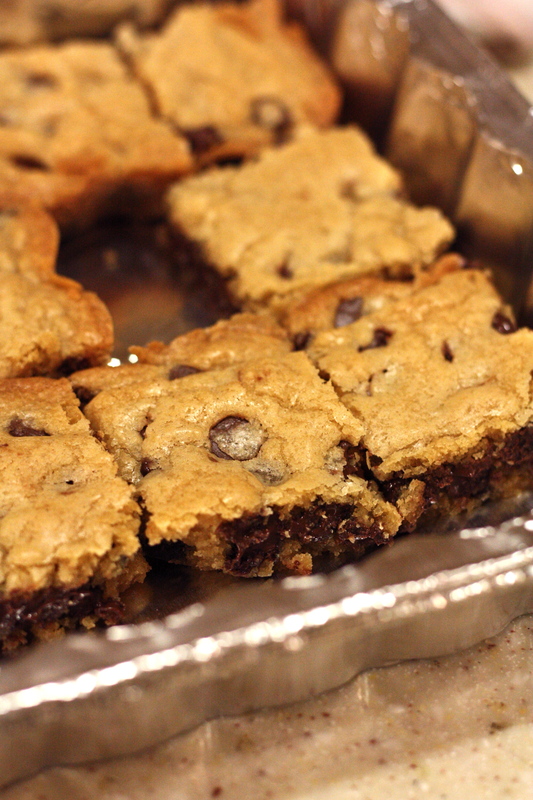 The recipe I used to make these devilishly good Chocolate Chip Cookie Bars is essentially a cookie recipe, but suitable to be baked in one flat sheet. I avoided an arm workout and got to enjoy the taste of chocolate chip cookies. As if the mention of not having to cream butter is enough, let me reiterate how simple this recipe is. If you need a dessert in a flash, this is it. 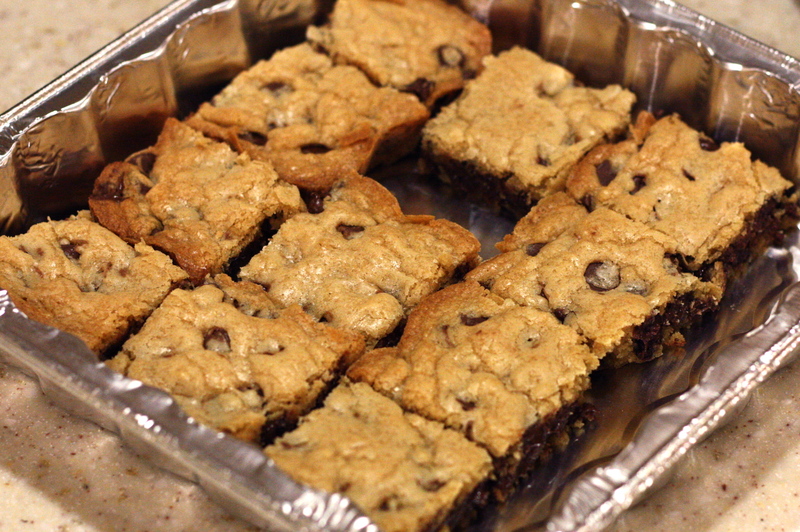 I used a good brand of chocolate chips, which I recommend for taking these bars up a notch.You of course could add nuts, other kinds of chocolate, or even dried fruit. Preheat oven to 350 degrees. Grease an 8 x 8 pan. Mix butter with sugars. Beat in egg and vanilla. Add flour, baking powder, and salt. Stir until combined. Stir in chocolate chips. Pour into greased pan and bake for 20-25 minutes, or until golden brown. I love chocolate chip cookies but I don’t like taking the time to make batch after batch of cookies! This is the perfect alternative.